A microwave oven with the Alexa assistant: does the world really need it? Shannon Liao of The Verge tried out the $60 microwave and started heating up some popcorn and other food via voice commands. While some of the advantages quickly became clear, the experiment also showed that users aren't the only ones who stand to benefit from Amazon's new smart appliance. You'll know this problem if you often find yourself reheating or defrosting food with a microwave. It's not always clear which power setting and which cooking time is correct. Your food might end up burned, partially thawed or half cooked. Burned popcorn is the worst. Presets are intended to help you avoid any annoyances, and some microwaves have tons and tons of them, especially more sophisticated models. This means you won't end up saving much time if you have to look up everything in a huge manual and then calculate the cooking time for 350 grams of frozen turkey breast. Some Amazon engineers have apparently had enough of this and developed a smart microwave to combat the problem. The Amazon microwave isn't exactly smart on its own, but it has Wi-Fi connectivity, Bluetooth, and can be paired with the Amazon Echo Dot. So this means you can control it via Alexa. Unfortunately, the device is currently only available in the US. The Verge editor Shannon Liao tested the microwave extensively and had mixed feelings. Her biggest takeaway was that this new device provides plenty of information on what Amazon actually plans to do with their smart kitchen appliances. Amazon has the right basic idea. To end the dilemma of having to many presets, the AI-supported voice assistant should be able to prepare food perfectly on demand: whether it's a potato, popcorn, a cup of tea, or 350 grams of frozen turkey breast. Some things didn't really work during the test, although the device did have an easy time making popcorn. Alexa asked how many grams were in the bag, and the popcorn was perfectly prepared. After that, Alexa asked how many bags of microwavable popcorn were left at home. And surprise! If you don't have any left, the system will automatically guide you to purchase more from Amazon online. The microwave had a harder time preparing a simple potato. The assistant also forgot to ask how much the potato weighed. And of course, the potato wasn't ready (or edible). And when the potatoes are gone, will Alexa simply add them to your shopping list? Amazon's approach of replacing preset buttons with functions on the language assistant is smart. But in actuality, assistants still aren't smart enough for this task. 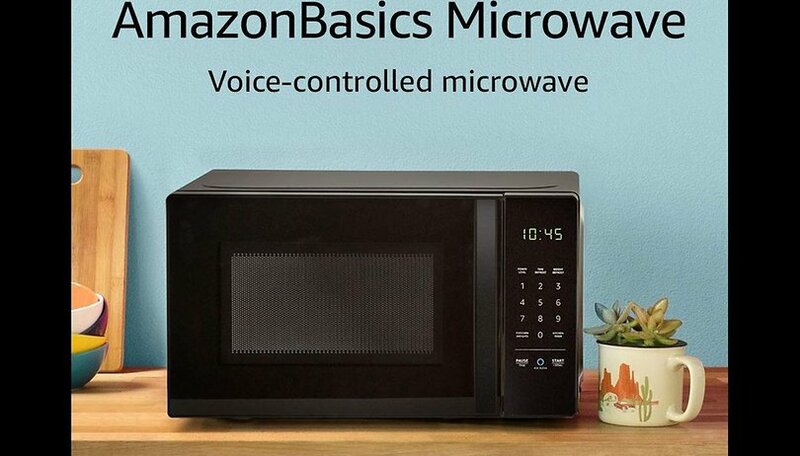 Amazon does share the learning process of its AmazonBasics microwave with third-party providers via the Alexa Connect Kit platform, so it's conceivable that there could be LG microwaves with Alexa in the future. But Amazon also showed us what it's really aiming to do with this feature: they want to channel more of our food consumption through their own platform. Would you put a smart microwave in your kitchen? Let us know what you think! Nuking potatoes is a must at our place. While the Panasonic MW runs great, the sticker along the bottom with the preset numbers is fading badly. Mighty Zeus knows where the recipe book is.